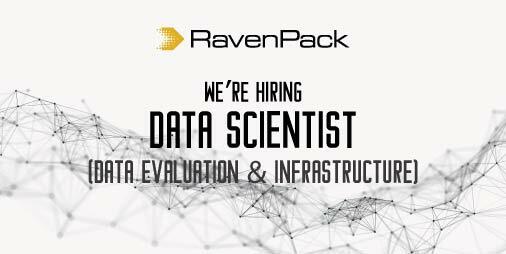 RavenPack is looking for a Data Scientist to join the Data Evaluation and Infrastructure team. The ability to communicate effectively in English both in writing and verbally is a must. Knowledge of Spanish is not a business requirement. European Union legal working status is required. Competitive compensation and a fun working environment. Relocation assistance available. Working remotely is not a possibility for this position. Participate in the maintenance and development of the internal Infrastructure. Processing and analyzing large datasets to evaluate them at different levels. Monitoring analytics to detect unexpected patterns and potential miss behaviour. Participate in the development of new products shaping the future of the financial industry. Acquiring sophisticated knowledge of Big Data applications across various asset classes and trading horizons. Interacting with fun and interesting colleagues across different departments in the organization. A Computer Scientist background with knowledge in Statistics, Mathematics, Machine Learning, etc. Hands-on experience with R and SQL. Analytical mind with a keen eye for detail. Experience in report generation, producing statistical summaries and ad-hoc research analysis. Knowledge of AWS services (Aurora/Redshift/Athena/S3…).